Teeth whitening, or bleaching, is a simple, non-toxic, non-invasive treatment we use to brighten the color of your tooth enamel to enhance the beauty of your smile. The procedure is performed first in our Santa Monica office and then by you at home, using the special materials we provide. Since tooth whitening only works on natural tooth enamel, it’s important we assess the condition of any dental restorations you may have (crowns, fillings, etc…) before the whitening procedure to ensure they will match your newly bleached teeth. Because tooth whitening isn’t permanent, touch-ups may be needed after a few years. At your first visit we’ll take impressions and make custom fitting trays that hug the gum securely in order to prevent bleach leakage. 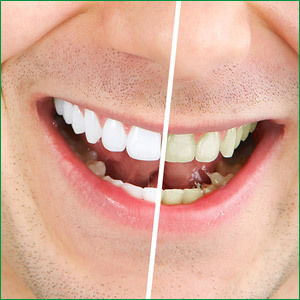 We also do a light deep bleaching session to condition teeth for your home treatment. At home, you bleach every night for one hour, for about ten days. After that, you come back for shade check and a second deep bleach session. With a professional tooth whitening treatment at Santa Monica’s Brightleaf Dental, you can turn back the clock and get that youthful creamy white back. Brightleaf Dental serves patients in Pacific Palisades, Brentwood, Santa Monica, CA and all surrounding communities. Contact Dr. Ana Brightleaf today for a consultation!